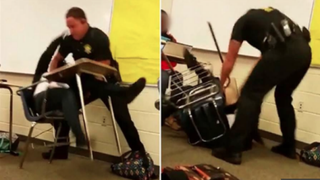 Former Richland County Sheriff’s Deputy Ben Fields shown yanking a student violently from her chair in October 2015 at Spring Valley High School in South Carolina. File this under “things we already knew but it’s good to have confirmation anyway”: a new report says putting more police officers in schools does not necessarily make them safer. Kenneth Alonzo Anderson, an associate professor at Howard University, conducted a study focused on North Carolina middle schools and found no relationship between increased funding for school resource officers and reduction in cases of reported school crimes. Anderson told the News & Observer that legislators around the country should look at his findings before rushing to put more police officers in schools—especially in the aftermath of events such as the Parkland, Fla., shooting. Anderson’s study was released in September and publicized this month by the Brookings Institution. The Education Justice Alliance, a local North Carolina group that has called for the removal of all police officers from schools in Wake County, praised Anderson’s report. The group believes there should be less police in schools because black and Latinx students feel discriminated against by the officers. Education Justice Alliance director Letha Muhammad told the News & Observer that calling for more officers in schools in the wake of such tragedies as the Parkland shooting is a “kneejerk” response. The National Association of School Resource Officers and its executive director Mo Canady see things differently. Canady told the News & Observer that SROs help to deter crime. NASRO estimates that there are 14,000 to 20,000 SROs nationwide. In North Carolina, there are about 1,200. School resource officers are usually members of local law enforcement assigned to work in schools and provide security. While Anderson acknowledges that SROs can help thwart crime, he also believes over-policing can be an issue as well. A Washington Post analysis found that of the more than 225 incidents on campuses since 1999, at least 40 percent happened at a school that employed an SRO. There were only two cases identified by the Post in the last 19 years in which an SRO gunned down an active shooter. Anderson wants to minimize the amount of contact that SROs have with students in schools to help students feel less threatened. He suggests that school principals and deans of discipline deal with minor disorderly conduct while SROs focus on very specific tasks such as reducing mass acts of violence. Canady disagrees, of course. He told the News & Observer that SROs need to have daily contact with students to gain intelligence and to build relationships. It is not surprising that an organization representing school resource officers would want to keep them in schools, but we have seen reported instances where those officers have done harm to students under their care—and those students usually tend to be black or brown. While having SROs on campus may make some feel that campuses are safer, the negative impact their presence has on students of color is a greater issue that needs to be addressed. There is a reasonable distrust of police officers in general in our communities. That doesn’t go away just because you try to pitch them as glorified camp counselors or cafeteria bouncers.